Fabric Paper Thread: How Green is Your Garden? Saturday morning view from the breakfast table. Robins, sparrows, juncos, chickadees. Twittering, chirping, flitting. A fat robin pulls a long worm out of the lawn. Sunlight angles across the garden. One bald eagle glides across the hedge. How could anyone stay indoors on such a lovely day? I abandoned thoughts of laundry and housecleaning, pulled on boots and gardening gloves, and spent a contented few hours cleaning out garden beds. There's life in those beds! Worms a-plenty to feed the birds and aerate the soil. Sharply pointed hyacinth leaves thrust upwards towards the light. Delicate, star-shaped moss clings to the rock wall. And the greatest surprise - one unfurling hydrangea leaf. It's early days yet, but these signs of the season to come hearten and encourage me. I pulled all the beets and carrots that I'd sown late last summer. The most slender carrots I roasted whole, along with beets, peeled and cut up before popping into the oven for an hour or so. Delicious, garden-fresh sweetness. Sunday's skies were not quite as pretty, but the rain held off and we walked around Rithet's Bog. Not many signs of spring there, but a harmony of browns and greys. And lots of Mallard Ducks paddling around. There's still a spot of two of ice and several ducks waddled across, rather than swim around. It was a busy place today. Oh boy your climate is different from ours. Those beets and carrots?! Look so good! Nothing green around here. But, I guess that's the way it should be here. How lovely to be out n the garden. Enjoy thise veggies. Your green mosaic is so comforting. green is a fantastic color right now! Dearest Lorrie; Wow, wonderful harvests from your own garden♡♡♡ I can see many ducks in the river now; may be until early March ;-) I've finished cleaning living room and start making dinner, haha. Have a great new week. Sunny days are such a lovely change from our grey frosty January days. We have had the odd good day recently, but although the sun shines, it is bitterly cold. So my garden remains untouched! But I admire, from the window, the beginnings of the Daffodils and Snowdrops. Nowhere near as green as yours!!! I think there might be a few little tiny bulb shoots coming out very near the house, otherwise all is still very dark and dank. Some of the snowdrops tried to make an appearance, but they seem to have retreated in the very cold frosty weather we are having right now. It is thick fog and icy out today! Brrr! So lovely to see things coming along where you are though, that is cheering and it shows that spring is coming! Looks like you've got a lot going on, too. But I am surprised since you're in Canada and I'm in Georgia! I didn't know that succulent (hens and chicks?) would survive outside in winter. Also, what is that pretty little yellow-ish plant coming up in the right photo? Love that! 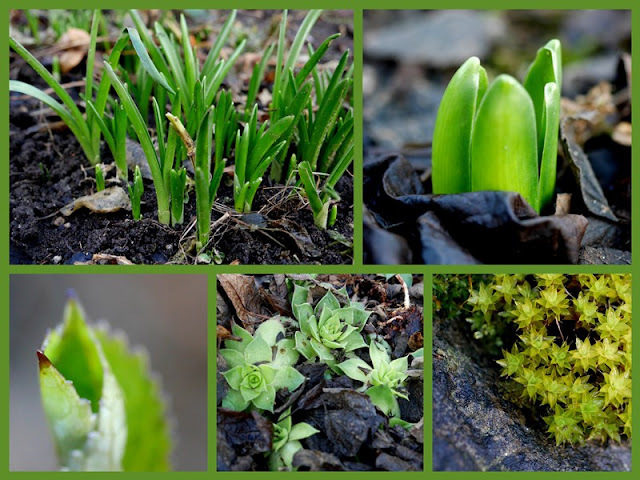 Such delightful surprises to find in your January garden. The roasted veggies look like a delicious treat. We had a weekend filled with rain with mild temps expected by mid-week. Hoping to get out there to do a bit of exploring myself. Fairly green, I'd say. We have plenty of daffodils nodding their head, flower buds on the flowering quince, iris spears shooting up and crocus shoots just popping up here and there. The feel is definitely more spring than winter here in Normandy. Your roasted winter vegetables looked delicious, there's nothing better than eating something you've grown yourself. Happy Mosaic Monday, hope you have a great week. OH I envy your Vanc. Island temperate climate! I guess I'm on the wrong side of Canada as my gardens are buried under crusty snow. So enjoy seeing "growing things" in the winter, even if only young green shoots! Enjoy your early days in the garden! Thanks for the spring preview! I did plant some new spring bulbs and some Canada 150 tulips in the fall.... Looking forward to their appearance! Tu as de la chance de pouvoir sortir au jardin. Nous avons une vague de froid et des températures négatives, avec des -12°C la semaine dernière. Là il ne fait plus que -5°C quelle chance ! A la fin de la semaine ça devrait aller mieux. Dans 3 semaines, les vacances et je pourrai commencer la taille des arbustes/rosiers au jardin. What a beautiful photo of those ducks! We have a pond nearby but there's always so much glare from the sun, that I rarely get a good photo. I love mild days when you can get outside. A bit too windy here today but nice and sunny! Hugs! Amazing winter harvest. I can imagine how good they tasted roasted. With all that green and garden work it seems like spring is on its way where you live. The grass is surprisingly green under the snow. The garden looks pretty white these days. Your garden is much further along. I love your description of what is going on. I am green with envy over your winter garden! You must know that you are the envy of us all, Lorrie! It looks like Spring there already. Maybe in four months I will be seeing all of that lovely greenery you have already. There is very little green here at my house yet. However, I was thrilled a few days ago when I noticed some sort of shoots (leaves) peeking out of one of the beds! Since this is our first January in this house, we're not sure, but we are guessing that they are crocuses. Fun! Your carrots and beets look yummy! Wow. So amazed at all the green happening at your house and loving the looks of those carrots and beets. Yum! I had a peek around the terrace this afternoon -- astonishingly there are still some red cherry tomatoes on one of the plants, numerous buds -- defeated by the frost, but still worth noting in their attempts -- on one of the roses, even some brave, furled wee blue blooms on the campanula....Wishing we'd thought to plant a big pot of spring bulbs in the fall before we headed out on our travels. This fall, for sure. Meanwhile, this winter-into-spring promises a cornucopia of surprises in our new "garden." Great post Lorrie, and wise to enjoy the outdoors as there is always tomorrow for chores. Lovely photos! Lovely images, as always, Lorrie. The green mosaic is indeed wonderful. The beets and carrots look scrumptious! Have a great day and week, too! We are having a mild winter but nothing is growing in the garden. Lovely photos of your neck of the woods! Wow! Beets and carrots from the garden. I had better go dig in my garden, I think there are carrots there. Love the browns and greys again a winter sky. Amazing all that you have growing in the garden. We do have crocus and daffodils beginning to come up. I think the daphne is beginning to get buds too. Isn't it amazing, life goes on. Beautiful greens and bounty with nice mosaics. Those roasted veggies look beautiful!